A record six time world champion, an Olympic Bronze Medalist, 5 times Asian Champion, Chungneijang Mary Kom Hmangte has always proved that a picture is worth 1000 words. Many people think that successful individuals are the ones who chose their career from self-interest and thus they achieve something in life. But there are also cases where other people prove to be an inspiration and thus a successful individual is created. Mary basically had interest in Athletics, Javelin, Volleyball and Football. It was the success of Dingko Singh in 1998 Asian Games where he bagged a silver medal in boxing that inspired Mary Kom to take up boxing. Mary Kom was born to Mangte Tonpa Kom and Mangte Akham Kom who were tenant farmers. Her financial condition was poor and thus Mary was determined to study hard and improve the family’s condition. Kom belongs to Kangathei village, Moirang Lamkhai in Churachandpur district of rural Manipur in Northeastern India. Lacking interest in formal education, she quit her school and gave her examination from NIOS, Imphal and graduation from Churachandpur College. Her practise, matches and career was on stake as Mary’s father was not at all pleases with her boxing as he thought that boxing would damage her face and it would be difficult for her marriage. Her father finally started supporting her after she won the State National Boxing Championship in 2001 and her father saw the photo in the newspaper. From 2002 to 2005 Mary won 2 World Championships and one Asian Championship. Mary Kom married Karong Onkholer Kom in 2005 whom she was dating for 4 years. Her career didn’t stop after that as she won another World Championship in 2006. She decided to pull back from the game for 2 years and concentrate on her married life. After the birth of twins Rechungvar and Khupneivar she decided to get back to the love of her life, boxing. 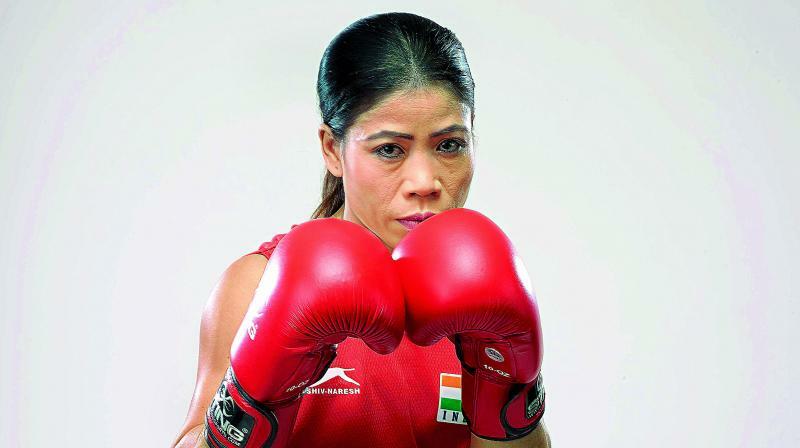 Her comeback was a grand one as she won a silver medal at the 2008 Asian Women’s Boxing Championship in India and a fourth successive gold medal at the AIBA Women’s World Boxing Championship in China. The federation decided to eliminate the lower weight categories and thus Mary had to shift to the 51kg category, where previously she battled in the 46 and 48kg category. She had to work hard to gain weight and stay fit for the upcoming 2012 London Olympics. The first Olympic round was held on 5 August 2012, with Kom defeating Karolina Michalczuk of Poland 19-14 in the third women’s boxing match ever to be fought at the Olympics. In the quarter-final, the following day, she defeated Maroua Rahali of Tunisia with a score of 15-6. She faced Nicola Adams of UK in the semi-final on 8 August 2012 and lost the bout 6 points to 11. However, she stood third in the competition and garnered an Olympic bronze medal. Mary continues to work harder as she wants to perform well in 2020 Tokyo Olympics. Despite performing well, she failed to qualify for the 2016 Rio Olympics. • Rajiv Gandhi Khel Ratna Award 2009. • And many other regional awards from various organisations. “Meethoi Leima” (great or exceptional lady) and Magnificent Mary are the titles conferred upon her. Her autobiography ‘’Unbreakable’’ became famous and popular after it was published in 2013. In 2014 Omang Kumar made a film on Mary Kom staring Priyanka Chopra in the main role. Mary continues to inspire millions through her exceptional display of boxing at the highest level representing the nation.